Blake Patterson’s review of the original Train Conductor ($2.99) on Touch Arcade remarked that it was “like Flight Control [R.I.P.] on rails”. That’s certainly the feeling I got from playing the latest game in the series as well. 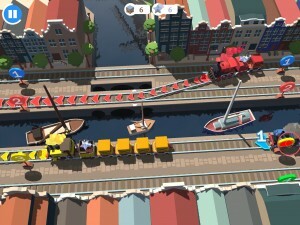 Train Conductor World (Free) truly feels like a blast from the past with its central mechanic of routing things around the screen with swipes, as I probably had at least five or six games on my phone back in the day that were heavily inspired by Firemint’s classic airplane game. I can’t remember the last time I played something like that, and it’s a heck of a lot of fun revisiting similar ideas in World. Of course, this is no longer 2009, and the App Store is a very different place now. Can The Voxel Agents’ cute little trains keep up? 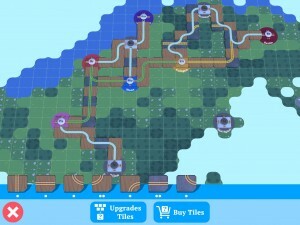 If you never played the original (or forgot about it), here’s how World works: Each level gives you several train tracks, usually stretching from the left side of the screen to the right. Randomly a marker on a track or two will start blinking to signal that a train is coming, and your job is to correctly route it to the track it needs to travel on. You can tell where it’s supposed to go by the color, and eventually you’ll have several differently colored trains on screen that all need to go to different places. It sounds simple enough, but the trick is to keep them from crashing into each other. The first time you play the game, you may be forgiven for thinking it’s a bit too easy. After all, the trains move slowly and you can even stop them with a tap if things get a out of hand. Eventually, though, things ramp up quite a bit. If you pass a level “perfectly” (more on that in a second) you’ll unlock a harder difficulty where everything moves faster, and the game gets shockingly challenging once you’ve sunk a few hours into it. Part of what makes the game so difficult (later on) is that in order to get a perfect score you have to make sure the trains never lose the stars they carry. You lose stars by stopping the trains or leaving them waiting for directions, so you basically have to scramble and route everything as quickly and efficiently as you can without ever stopping or having any crashes. It’s incredibly tricky on higher difficulties, but supremely satisfying when you can pull it off. The trains are random every time, too, so luck plays a small part as well. In fact, sometimes it seems like there’s no possible way to beat your current scenario without stopping things since trains often need to go to the same place. Despite that, I do get the sense that if you’re clever enough with your routing and re-routing (like deliberately putting a train on the wrong track to stall it or keep it out of the way), pretty much every level and difficulty can (probably) be finished without losing any stars. Luckily, you don’t actually have to play that way. You can take things a bit slower and not worry about the stars and still beat each level and have a good time. You may not unlock the higher difficulties, but you’ll still be progressing. 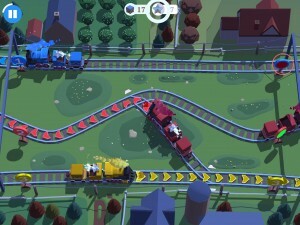 That’s because each train also carries coins, and when you get enough coins you’ll unlock new track tiles. These are used to open new locations on the map, and it’s actually pretty clever how it all works: There’s a build mode on the level select screen, and when you enter it you’ll be able to lay down your tracks however you want. Ideally you’ll want to connect the different city hubs together as efficiently as possible to unlock the locations you haven’t been to yet, but you’re given the freedom to choose how you do it and in what order you unlock new cities. Since this is a free-to-play game, though, that means there are special rare iron tiles you need in order to build over rough terrain. You can combine regular tiles to create the iron tiles, or you can just wait until you get one randomly. Or buy some from the store. The tile system is definitely there to gently pressure you into spending money, but it’s not bad. I’ve already unlocked eight locations without spending a dime, and I’m having a grand ol’ time playing through them over and over. There are also ads in the game, including opt-in videos to continue a level once you’ve crashed, but they don’t get in the way too much and you can get rid of them with a very reasonable $1.99 purchase. The only other IAP in the game is to buy new trains, but these are basically just skins and can easily be ignored if you just want to play for free. I really can’t say enough good things about Train Conductor World. If you were around in the early days of the App Store, the game’s touchscreen chaos management will surely fill you with at least some nostalgia, and it’s all wrapped up in an incredibly good looking and fair free-to-play package for newcomers. Sure, it’d be nice if the “iron tile” mechanics weren’t there to slow your progress down, but the tile system as a whole is such a genius idea that I can forgive the slight freemium squeeze that comes along with it. If you’re looking for a game that’s fun, challenging, and costs absolutely nothing, then this is the train you’re gonna wanna catch.